It has been a while and I apologise for that, in between a busy work life and a crazy social life, as well as running another couple of blogs and helping admin a facebook page (yes, I have been cheating on you) this one has been a little neglected of late. I promise I will be trying to get back on the horse and when I saw this recipe idea (on the Australian quorn website no less) I just had to give it a try. SO glad I did, these are excellent and such an innovative use of quorn fillets - they taste amazing and have a texture not dissimilar to fish cakes. I wondered whether these would be tricky to shape and cook but actually, as you can see from the pictures, they held their shape well. So, I thawed a bag of fillets overnight and then whacked them in the food processor with a bunch of coriander, a 2cm cube of fresh ginger, 5 spring onions, 2 cloves of garlic, 1tsp sugar, 0.5 tsp turmeric, 0.5 tsp chilli flakes and an egg. I blitzed it until it was all minced up and clearly ready to make into patties (this took a couple of attempts, stopping and using a spatula to clean down the sides). This mix made 7 cakes for me (though the recipe states 8) and based on 7 cakes they work out at 159 calories per cake when cooked in 2 tbsp of oil. This makes a very satisfying starter or side dish for the calories. 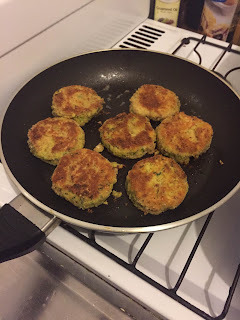 I will definitely be making these again and now I know how well quorn can be blitzed into a texture suitable for patties it opens up some interesting possibilities. Enjoy!